The Exclaim! Holiday Gift Guide continues with our guide to finding the perfect gift for the film buff on your list. Originals, remakes, special editions — it's all of the utmost importance to the cinephile, so make sure you're getting the best of the best by consulting our picks below. The eight-film series balloons into this 31-disc collection (pictured above), containing all previously released bonus material as well as an additional five hours reserved just for this set. But the real draw is the case. 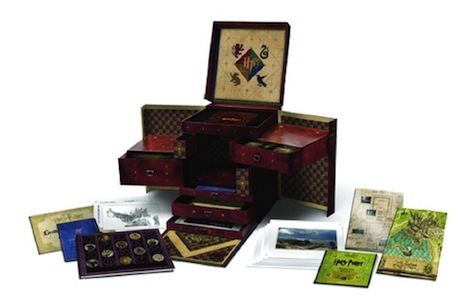 Held in a limited-edition box based on the Weasley twins' Skiving Snackboxes, the set's multiple drawers house not only the films themselves, but concept art and a replica locket horcrux. David Wain's latest kinda died at the box office, but don't let its theatrical performance sway you from one of the year's funniest movies that skilfully lampoons urban/suburban/commune living. Along with all the usual bells and whistles, the Blu-Ray edition gives you two films for the price of one, adding an alternate cut that changes, alters, or extends almost every joke in the original film. After years of poor-quality, alternate-region DVDs and bootlegs, this Japanese blood-fest finally got a proper North American release this year. What timing: the story of a middle-school class forced to fight one another until only one student is left alive is eerily similar to a certain Hollywood blockbuster of lesser quality (and a lot less gore). Anyone dissatisfied with The Hunger Games' lack of satirical bite and PG-13 rating should give Kinji Fukasuku's final film a try. For zombie fans, this one's a no-brainer. Not only do you get the four-disc second season of Robert Kirkman's zombie apocalypse masterpiece that includes an alternative version of the season premiere, but the set comes housed in this attractive, screwdriver-impaled zombie head to boot. Yeah, Tim Burton's kick at the Dark Shadows can was a bit of a disappointment, but the true obsessive knows that the original is always best. So it's no surprise that this gargantuan, 131-disc set features all 1,225 episodes of the late '60s soap opera housed in a coffin-shaped case. Although it's the most expensive set on this list, it also clocks in at 470 hours, so it gives you the most bite for your buck. The idea of anyone messing with the Star Trek franchise a la George Lucas's digital "enhancements" is enough to send a shiver down the spine of even the most casual Trekker. Thankfully these hi-def remasters of the original 35 mm film negatives were meant to retain the look and feel of the original show and upgrades to special effects (space ships, phaser blasts, Riker's beard) ensure that the 24-year-old effects keep pace with the rest of the pristine transfers. Even obsessives need to ask themselves, "Do I really need yet another version of this film?" We say yes. David Lean's sweeping World War I desert epic still features some of the best cinematography put to celluloid, so picking up a hi-def version is a must. Plus, this four-disc anniversary edition comes with a generous helping of bonus features including four featurettes, a "Making Of" documentary, the film's famed soundtrack and a coffee table book. Check in later this week for The Exclaim! Holiday Gift Guide's installment on Music Gift Sets, and the gifts a host of Canadian musicians want to find in their stockings this year.